While previous years have given us beautiful skies and almost-perfect drag racing weather, 2015 would be a little different. Unfortunately, the weather seemed determined to undo all of the behind-the-scenes hard work that went into making the Petrolhead Father’s Day Drags 2015. The initial date of Sunday, September 6 was unfortunately rained out. So, too, was the rain date of Sunday, September 20. Not to be put off, the event was postponed until Sunday, November 22 — surely, a week before the official start of summer, the weather would play ball? Maybe, maybe not. During the week leading up to the event, the forecast was all doom and gloom, but there was a thin ray of hope that the weather would clear up on Sunday. 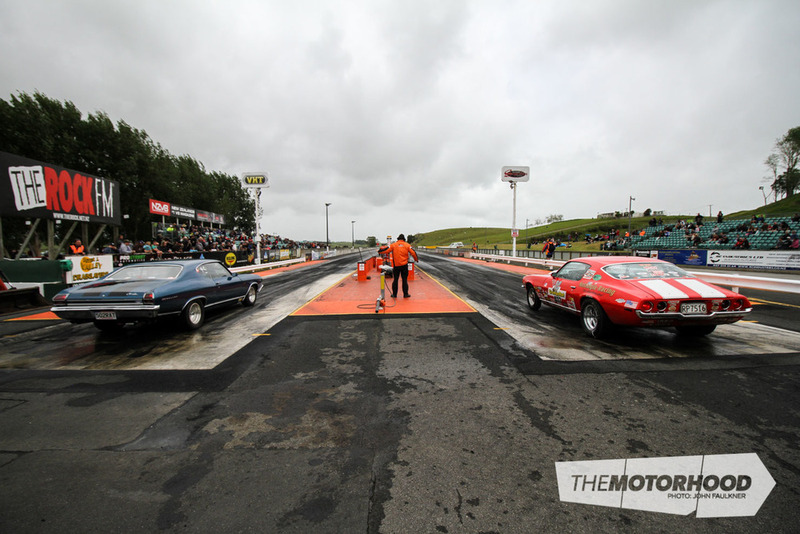 The American Muscle Car Club (AMCC) and Meremere Dragway ran with it, and that proved to be the right choice — even though it bucketed down with rain the night before, and the day was punctuated with brief drizzle, it was nothing that couldn’t be worked around. Not to be put off by the damp grounds, the Meremere team were straight into it, getting the track surface all ready for the big day. By 10am, the track was thoroughly prepped, and racing was ready to begin. Held on a dial-your-own (DYO) format, consistency — rather than outright speed — would be rewarded, with the exception of the Merlin Top Eight Shootout, held on a heads-up format. The day’s first car through the traps was Reg Pountney’s tough ’67 Mustang, running an 11.3, and entertaining the crowd with a decent-sized burnout — something he’d continue to do throughout the day. 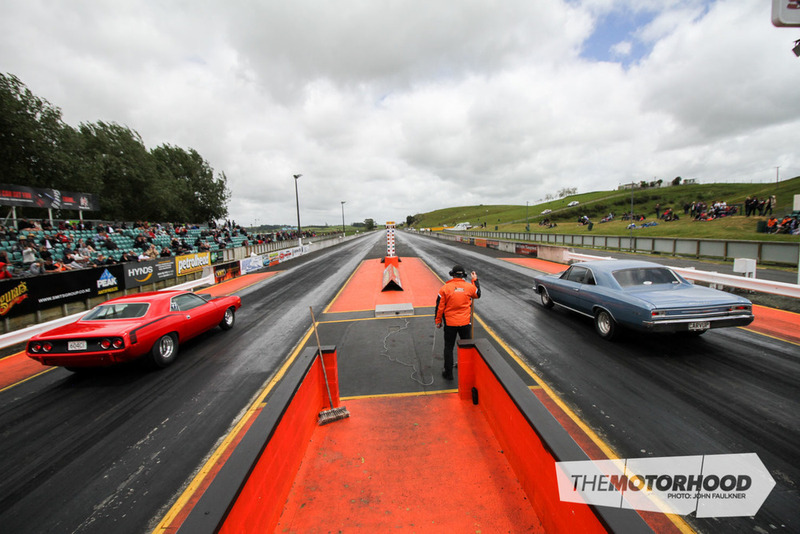 That’s pretty bloody quick for something with a warrant and rego, and it’s important to note that Father’s Day Drags is only open to street-legal vehicles — impressive, considering the calibre of some of the vehicles in attendance. 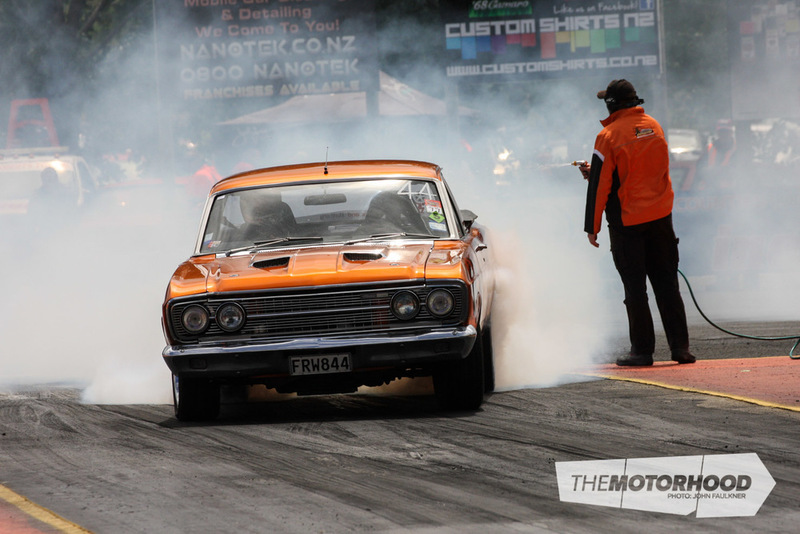 This ’65 Impala not only ran 11s like clockwork, but had a crack at popping some tyres on the burnout pad later on in the day. 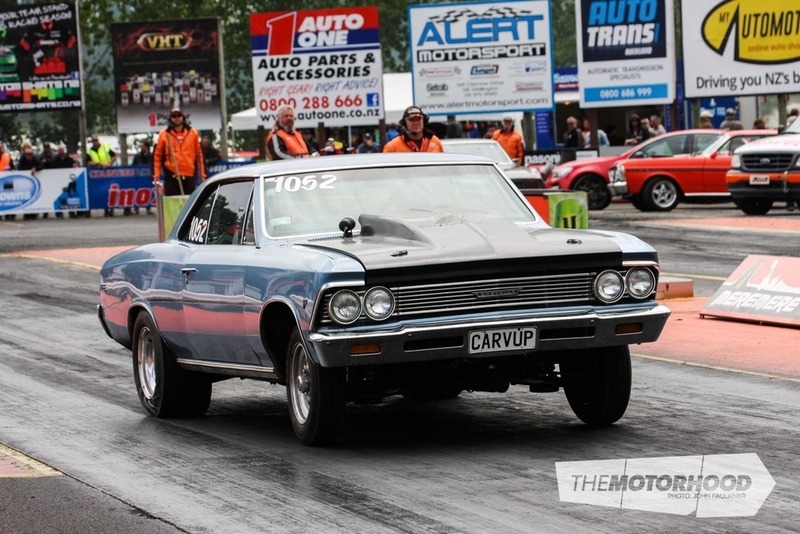 Perhaps even more of a sleeper than the monster Impala was Grant Cameron’s ’70 Holden HG — powered by a stroked small block Chev displacing 377ci, and a column-shifted TH350, Grant was running low 12s on a dial-in time of 12 seconds flat. When not on the track, it wears a full set of factory steel wheels and hubcaps, making it an extremely deceptive package. It still looks like the 186ci straight-six–powered ’60s saloon that it started its life as! 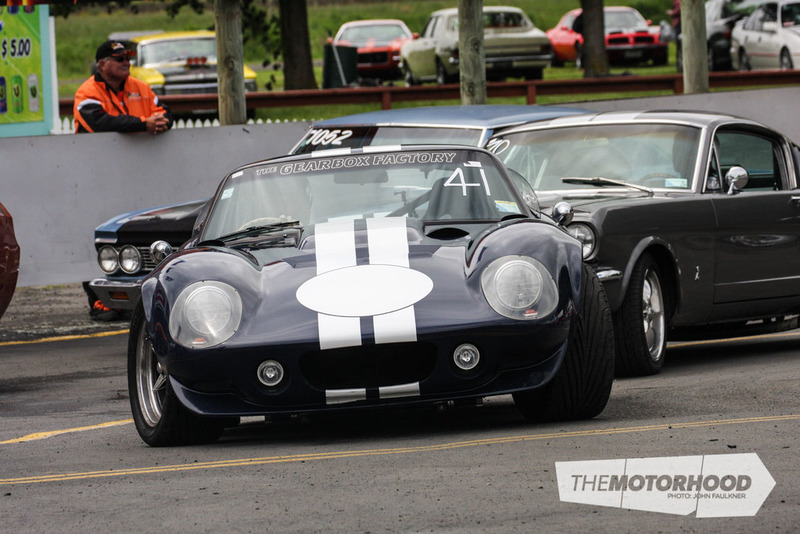 ‘Street-legal’ didn’t discriminate, either, and some of the vehicles lined up to race were definitely not of the variety you’d expect to be seeing at a dragstrip — cars such as Keith Lane’s Shelby Daytona Cobra replica. 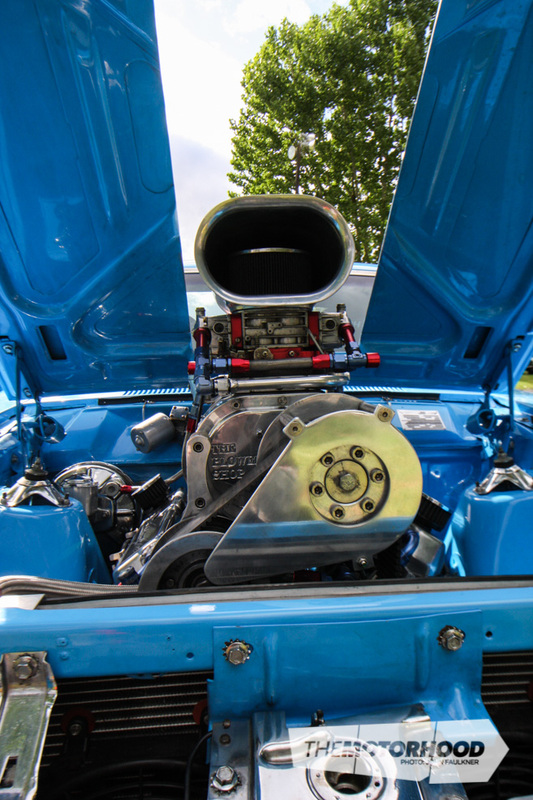 Keith’s Daytona runs a 347ci stoker, backed by a Tremec TKO600 five-speed manual. While the manual gearbox isn’t the best for consistency down the strip, Keith was happy with his 12-second passes, and having a lot of fun behind the wheel. 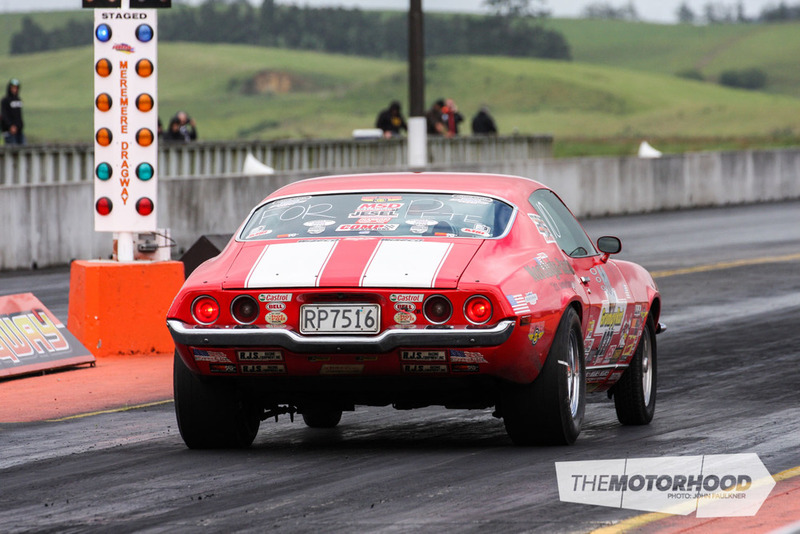 And we can’t forget that Father’s Day Drags is the home of some of New Zealand’s quickest street-legal vehicles — at what other meeting would you be likely to see a street-legal vehicle run a 7.854 at 179.5mph, let alone with ominous grey clouds hanging overhead? Unfortunately, the racing was interrupted around 11.30am by some light — albeit very brief — drizzle, and as soon as it cleared up, the damp surface was attacked by the Meremere workers, who got everything ready for racing in record time. Clearly, the precipitation that had plagued the opening half of the day wasn’t too much of a challenge for track workers, as drivers continued launching hard off the line and posting rapid times. Barry Plumpton managed to run a PB of 8.833 at 147mph — and that was with him lifting near the end of the track, as he’s previously run as fast as 159mph down the quarter. The dragstrip action was momentarily halted again at midday, this time for entirely welcome reasons — vintage aircraft performing aerobatics and smoke trails provided an excellent interlude, as well as an emphasis on the sheer level of thought and planning that is put into this event. 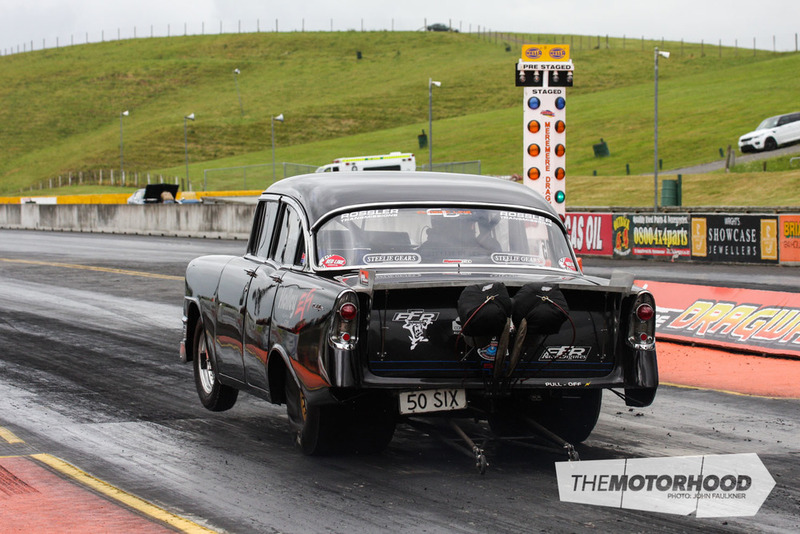 The variety wasn’t limited just to the air, either — since we had a whole day for drag racing, the Burgerfuel burnout competition was also held around midday, preceding the Merlin Top Eight Shootout. While this year’s limited spectator numbers appeared to translate into a limited number of skid cars, the entrants that were there didn’t hold back. 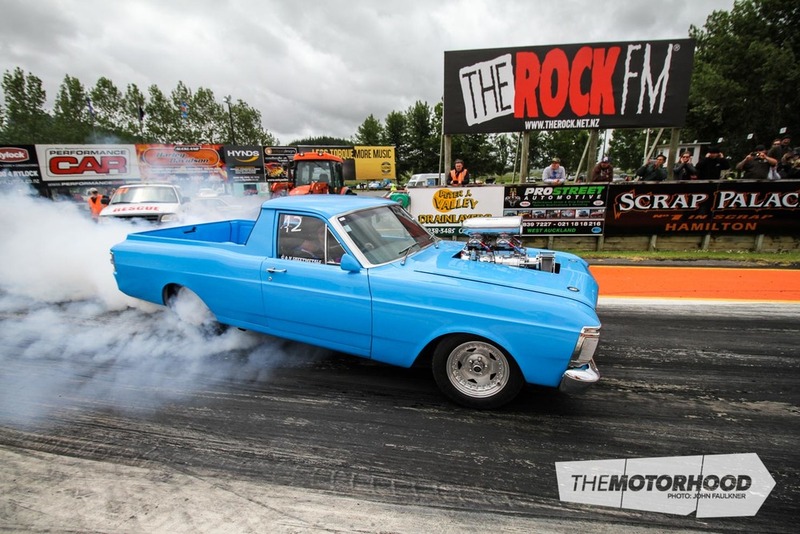 There could only be one winner, though, and honours were granted to Ricky Ireland, whose 8-71–equipped 496ci big block–powered Holden HZ ute destroys tyres with ease. 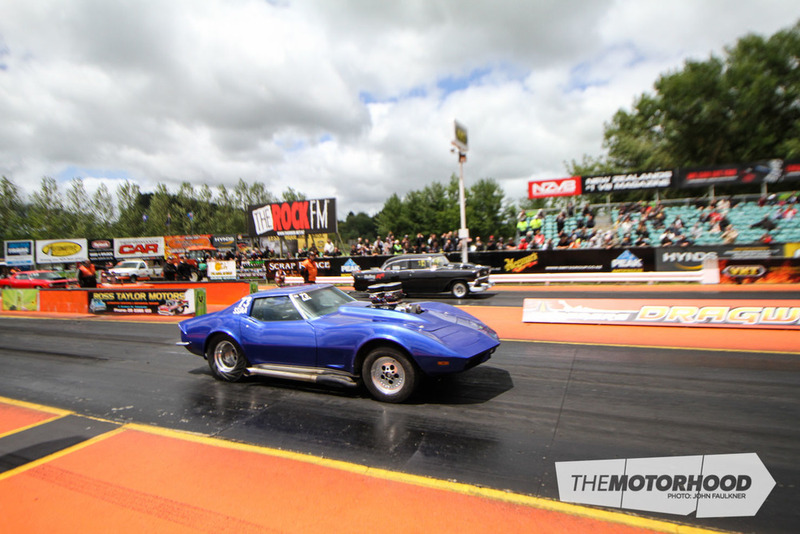 The second half of the day was to hold the serious drag racing — the Merlin Top Eight Shootout was a heads-up format segment, determined to find the quickest American and Australian street cars. The winner of each race would, quite simply, be the first across the line. Starting with the eight quickest American and Australian cars, they would race amongst themselves across three rounds, to identify the victor. 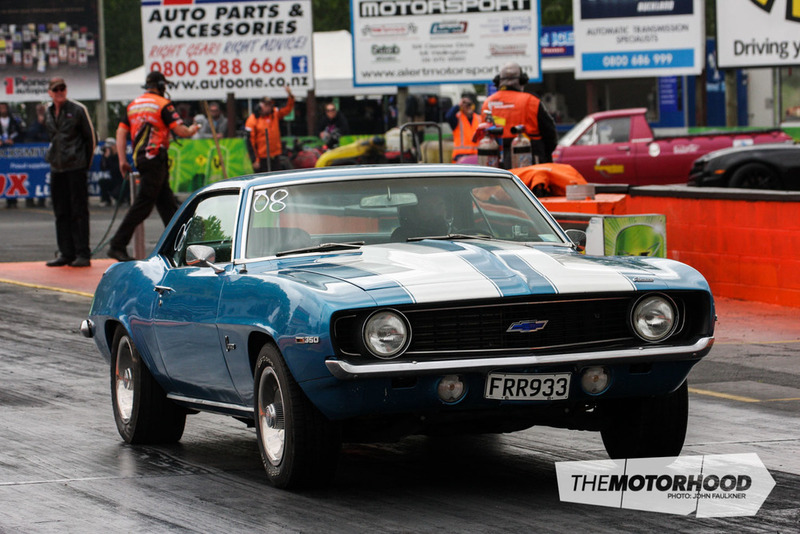 Here, we see Rob McBride's Cuda facing off against Craig Wall's blown Camaro. How’s this for an American shootout — Rob McBride’s 604ci Ray Barton Hemi–powered ’73 Cuda up against Steve Wall’s Procharged 540ci big block–powered ’66 Chevelle. As a second round Top American race, held on a heads-up format, the victor would progress to face Reece Fish in the final. Steve Wall came out on top, running a 9.311 at 150.65, to McBride’s 9.861 at 135.66. Meanwhile, the Aussie contingent were slugging it out amongst themselves in the concurrent Top Australian shootout. Kathryn McDonald (whose ’69 Valiant VF we featured in NZV8 Issue No. 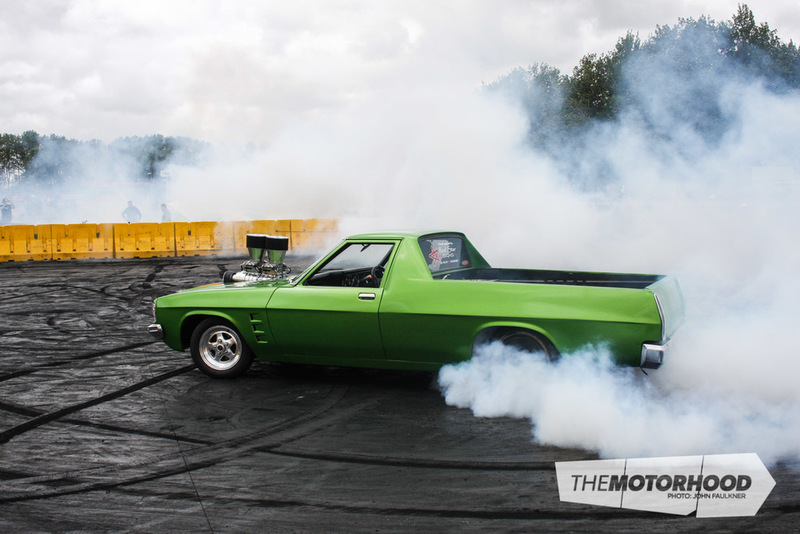 119) faced off against Mathew Patmore (whose ’71 Falcon XY ute was featured in NZV8 Issue No. 64) — it was McDonald who progressed to the next round, running a 10.427 to Patmore’s red-lit 11.942. 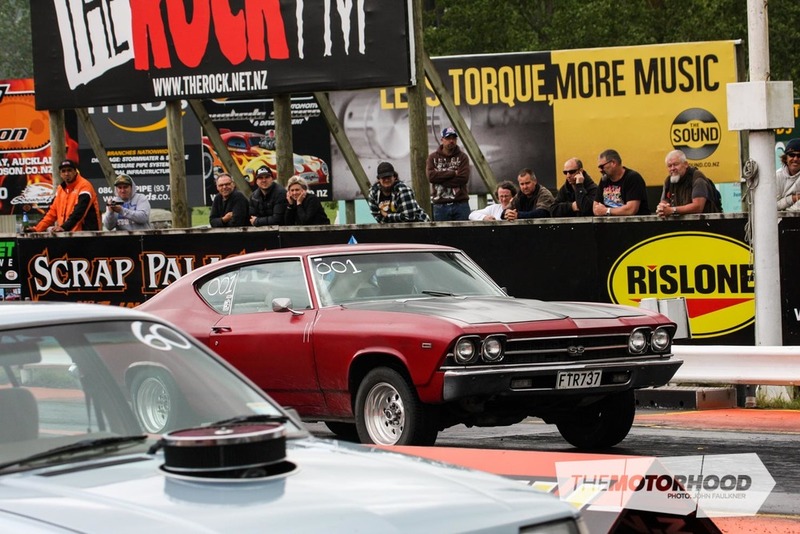 It was all business in the Holden camp, with Barry Plumpton’s HQ squaring off against Shane Ryland’s little Torana. 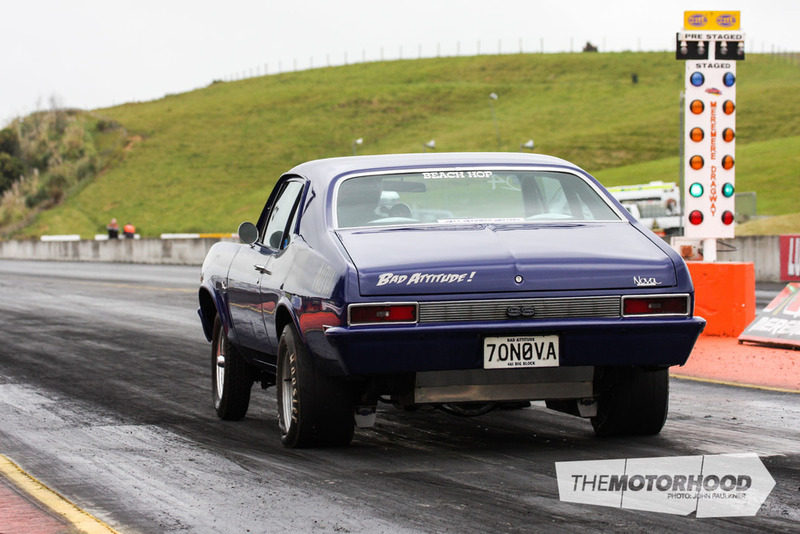 Although the victor may have looked clear-cut, Ryland’s Torana is packing a turbocharged LS2 under the bonnet, and has run a PB of 9.64 at 140.82mph. Ryland got a bit too keen, though, handing it to Plumpton on a red light — still, with Plumpton’s 9.463 to Ryland’s 9.778, the racing was as close as the crowd could have hoped. Reece Fish had, rather predictably, made it into the Top American finals, although we can’t disregard the efforts of Mike Carlton, who Fish dispatched to get there. Running his blown ’73 Corvette, Mike managed to run a spectacular 9.595 at 141.05mph, though he was still blown away by Fish, cruising across the line in 8.52 seconds, and a lazy 116.81mph. With Reece Fish having dipped into the sevens, Steve knew he’d need to get in a perfect run to realistically stand a chance. While Steve’s Chevelle is by no stretch a slow vehicle, having run a PB of 9.17 at 153mph, Fish was clearly in the quicker vehicle. Even so, this is drag racing, and strange things have been known to happen. Unfortunately for Steve, the pressure to get in that perfect run saw him jump the gun and red-light by a mere 0.049 seconds — enough to hand it to Reece on a plate. He didn’t hold back, though, and blasted through the traps in 7.869 seconds at 177.88. By now, the Aussie competitors had been narrowed down to the finalists of Barry Plumpton, in ‘BLWNHQ’, and Matt Kriletich, piloting his Falcon XA coupe. Matt recently ran a PB of 9.98 at 135.36mph, although he was running consistent 10s on the day. Hard launches from both, and they were off, with Plumpton trailing a thick plume of white smoke to around half-track, before a big fireball ejected from beneath his car. A severed transmission line appears to have been the cause of the excitement, and despite that, he still ran a 9.975 at 114.5mph to Kriletich’s 10.05 at 133.5mph. This also meant that the anticipated Fish versus Plumpton showdown would have to wait — what might Father’s Day Drags 2016 hold in store? The oil-down was promptly attended to by the Meremere staff, and although transmission fluid appeared to be a little more labour intensive than the earlier drizzle, the track’s surface was — once again — clean, prepared, and good to go. With the shootout sorted, the ‘slower’ cars— for want of a better word — could get back into the DYO racing. This allowed some awesome pairings, such as Trevor Smith’s Chev Nova lining up against Greg Kroon’s Pontiac Ventura. Greg’s got the quicker car of the two, but this was a particularly fun race to watch, helped by the pair of enormous burnouts laid down prior to racing. That pretty much set the tone for the remainder of the day’s racing — getting out on the track against your mates, messing around with massive burnouts, and, above all, having a good time. That said, the fun factor was not to say the DYO classes were lacking in down-to-the-wire drag racing excitement — one of the final rounds saw some real neck-and-neck racing, with Anthony Clarke's Commodore VK facing off against Mark Peacock's '67 Barracuda. With both running 11.80-second dial in times, the result would be anyone's guess. Anthony ran an 11.897 at 111.73mph to Mark's 11.836 at 114.63 — however, thanks to Anthony's quicker reaction time of 0.208 seconds to Mark's 0.458, it was the Commodore that took it ... just. Awesome racing! Here’s hoping 2015 used up all of the forthcoming years’ rain on Father’s Day, and we can look forward to three years of dry events. Rain or no rain, though, it takes a special team to create such a successful event — especially from such dire circumstances, and the AMCC, Meremere Dragway team, and everyone else who helped to make it happen must be thanked and congratulated for their efforts. Who’s ready for Father’s Day Drags 2016? 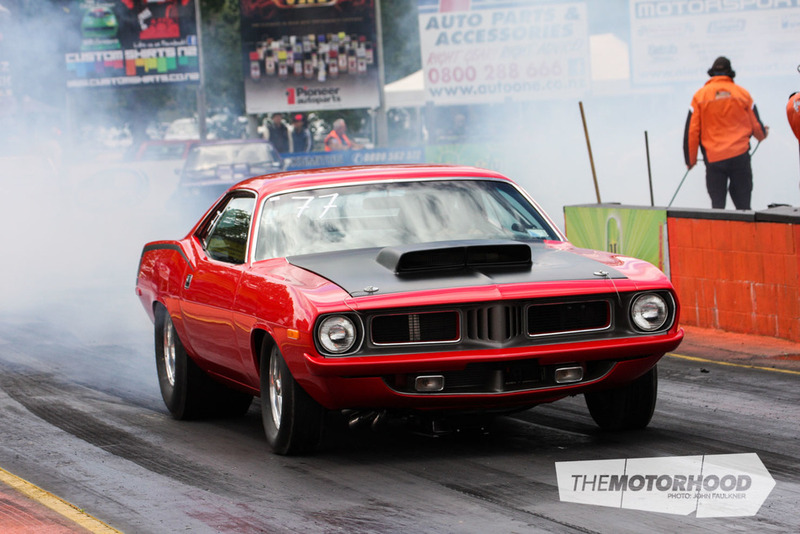 A full list of results is available on Meremere Dragway's website.